A new photography exhibition aims to document the life of Dublin’s homeless. The difference is in this case the photographers are the homeless themselves. THERE ARE MAJOR homelessness and housing crises at play currently in Ireland. We hear about them almost every day. Some of us have experienced the pinch via spiralling rents, particularly in Dublin. Others can’t afford to buy a house, or to hold onto the home they already own. But how many of us can really imagine what it’s like to be homeless? The In Sight Project is a new exhibition that takes an alternative slant on what life is like for those on the streets. In putting cameras into the hands of 45 people living rough (or who had recently done so) in Dublin city, the results are at turns humorous, hypnotic, and heartbreaking. Insight is the brainchild of marketing professionals Lucy Ryan and Lynsey Browne. Ryan and Browne approached the Dublin Simon Community who were “delighted” to come on board. Simon provided them with a reference letter which they were able to take to sponsors. “There’s no budget behind this – anything we’ve done we’ve gotten from either partners or sponsorship,” says Lynsey. We got in touch with Des Byrne, a photographer who’s founder of the Dublin Street Photography Group. A friend of Des bought us about 30 disposable cameras, and we got another 20 or so from Fuji. Meanwhile Simon reached out to those who use their services to see if they’d be interested in documenting a day in their life for us. About 18 initial respondents soon came on board. Their reasons for doing so are varied. Some wanted to do a little something in gratitude to the Dublin Simon Community and the Capuchin Day Centre (who came on board with the project a little later) for the use of the services they provide. Others were interested in photography, had a camera or had once had a camera. Some are just creative people. “For others, they’re just bored and want something to do,” says Lucy. 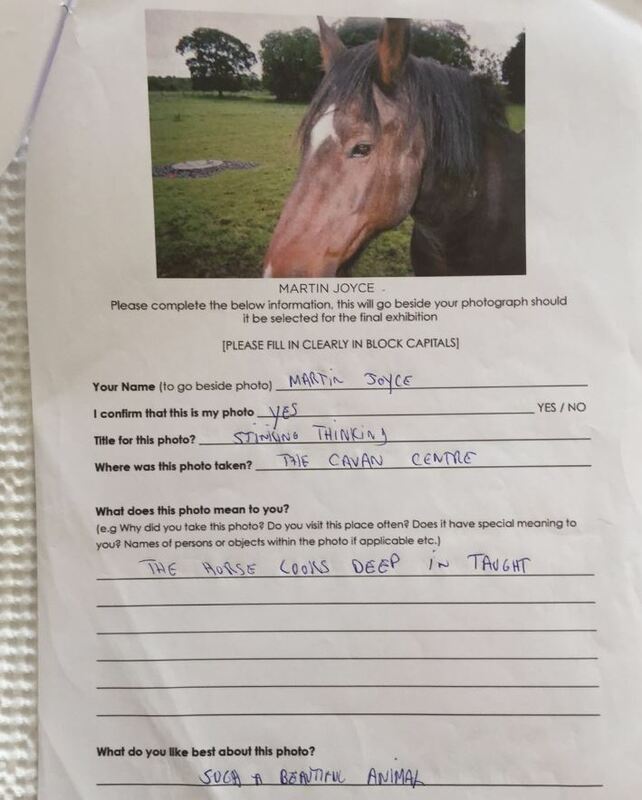 Each photographer was asked to write down where they’d been, and why they took each photo. All told, the project saw about 30 cameras returned. The quality of photos was “truly impressive” according to Lucy and Lynsey. One of those taking part, Brendan ‘Fred’ Duffy, a native of Finglas in north Dublin, told TheJournal.ie that he “really enjoyed” taking the photos. Brendan had been living homeless for the past five years as he battled a drug-problem, although he has now started living in a flat. He took part in the project because he wanted “to raise awareness” of the Capuchin Centre for the homeless services it provides. “I thought it was really good, yeah. I really enjoyed it,” he said. I travelled around and wrote down everywhere I took a photo. I was taking pictures of cats, a box on the street, locked up bikes, flowers, people sleeping rough in a stairwell. Brendan’s story of drug addiction is common to many of the contributors to the project. Others have left broken lives behind in other countries. Still others struggle with mental illness. “It’s about seeing the world through their eyes,” says Lucy. We wanted real stories of homelessness, and that meant a really wide open remit. We wanted them to express themselves. The project exhibition will kick off from next Thursday 5 May in the Powerscourt Town Centre in south Dublin city centre. The exhibition is being put on free of charge at the Powerscourt, just one example of how Ryan and Browne have been “blown away” by people’s generosity when it comes to staging the event – all catering and equipment for the event is being provided by local businesses. About 30 or 40 high-quality prints will be featured in the exhibition (and sold at the launch next week) which will run until 29 May. Prints of all photos will be available for purchase from the exhibition’s website, with all funds going to the Dublin Simon Community. “At the end of the day this is about raising awareness,” says Lucy. Hopefully this will be an insight into the experience of being homeless, of how people cope. The In Sight Project will run from 5-29 May in a gallery space at the Powerscourt Town Centre on South William Street, Dublin 2. All photographs will go live on the project’s website from 5 May and will be available for purchase from that date. The project can also be found on Facebook and Instagram. All proceeds from the exhibition will go to the Dublin Simon Community. Read: Open thread: Rent rises, housing lists, homelessness – what’s the number one issue for you? Email “Life on the streets - how Dublin looks to a homeless photographer”. Feedback on “Life on the streets - how Dublin looks to a homeless photographer”.